There’s a few things that you’ll always find in our refrigerator, things that fall into our Can’t Live Without category: salsa, lemons, limes, Greek yogurt, milk, half & half, cottage cheese, pickles, hot sauce, baby carrots, beer, and pomegranate juice. Actually I think the list is probably longer based on the amount of stuff that’s regularly in our frig, but those are the very first things that come to mind. Yes, we fell under the spell of the POM Wonderful pomegranate juice last year and now regularly have a bottle in the frig for all sorts of purposes. 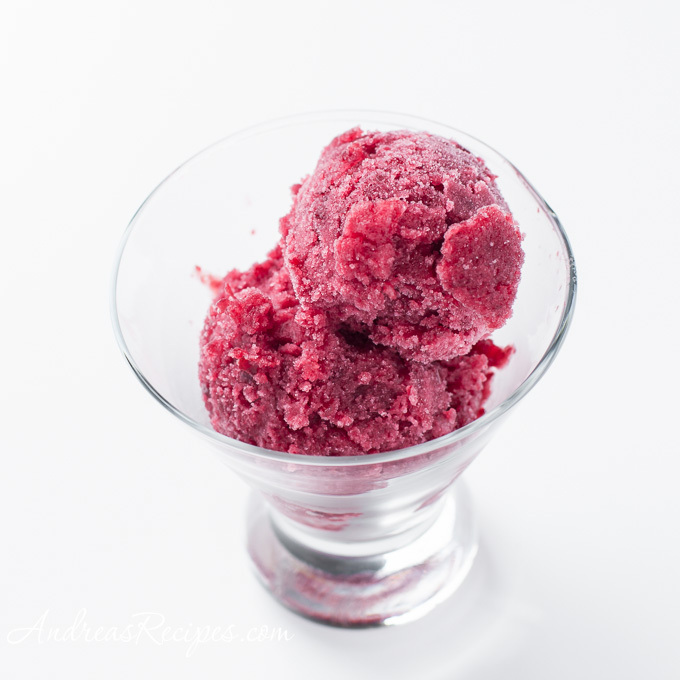 My favorite is of course mixing drinks, but it also makes delicious icy desserts such as this cherry pomegranate sorbet. There’s just something about that gorgeous red color that grabs your attention and draws you to it, and though it’s simple to make it is a stunning treat for guests, just serve in cocktail glasses. The flavors meld together, neither overpowering the other, and a touch of lemon zest brightens it up and makes a very refreshing dessert to beat the heat. When I make sorbet with cherries, I like to use the blended cherries without straining because I think it gives more flavor, plus we like to munch on the small cherry bits, but you can strain if you prefer. 1. In the saucepan combine the sugar and water. Cook over medium heat until completely dissolved. Let cool for 15 minutes. 2. In the blender, purée the cherries, pomegranate juice, and lemon zest with the syrup until very smooth. Pour into the bowl. Cover and refrigerate until chilled, at least 4 hours or overnight. 3. Churn in an ice cream freezer according to the manufacturer’s directions. Transfer the churned sorbet to the plastic container. Press a layer of plastic wrap against the sorbet and seal the lid on top. Freeze until fully hardened. lovely! all your frozen desserts are so refreshing and gorgeous, but this sorbet recipe wins te prize! It looks amazing! Looks lovely! I just posted about a cherry sorbet the other day as well. but, I didn’t think to amp it up with some POM. Great idea! What a great combination! That color would certainly excite me at the end of a meal!